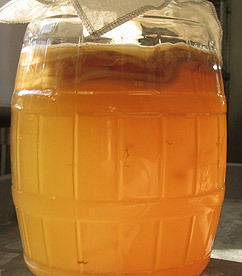 Kombucha is a naturally fermented traditional beverage made from a mother culture and sweetened tea. The mother culture (known as a SCOBY) is a symbiotic colony of healthy yeast and bacteria. The micro-organisms in the culture break down the sugar and other components of the sweetened tea and create a fizzy, slightly sweet and tart drink. The resulting tonic is high in organic acids and a variety of other compounds that are thought to be supportive to health. Best of all, it tastes great! We started making kombucha tea in 2005 and have been working hard to make the best tasting and potent kombucha possible. Making the best quality kombucha requires great ingredients, careful brewing practices, attention to detail, and knowledgeable brewers. We have brought together all of these components to make great kombucha. We start our process by making a sweetened tea base. We use triple-filtered water to ensure a clean, healthy start to the brew. We then steep high-grade, fairly-traded organic teas in our steam kettle followed by adding organic cane sugar to provide food for our mother cultures. This sweetened tea is transferred into our fermenters where it is metabolized by our kombucha mothers. After a couple weeks the sweetened tea has been completely transformed into a finished kombucha tea. We transfer the finished kombucha into our bottling tanks and lightly filter it in order to get any large, naturally occurring pieces of culture out of the liquid. It is then flavored with select fruits, spices, or herbs and bottled or kegged. For information on our tap program, click here. Traditionally brewed using all loose leaf teas, organic sugar, and real kombucha culture. No additives, laboratory grown strains, or GMO ingredients used. Made with certified organic sugar purchased through Equal Exchange from the Manduvira Cooperative in Paraguay. Organic Teas purchased through Equal Exchange Direct Trade with various farmer cooperatives. Our kombucha contains 4-6g sugar per 8 oz serving. It makes a refreshing alternative to soda! Certified organic Blueberries from The Benson Place, Heath, MA or Burke Hill Farm in Cherryfield ME. Organic fresh-pressed ginger – pressed in-house – from Kauai Organic Farms. Concord grapes from Growers’ Cooperative Grape Juice Company in upstate NY. Certified organic blue green algae from E3Live . Each bottle contains 750mg algae. Organic cordyceps mushrooms from Aloha Medicinals. Each bottle contains 500mg organic cordyceps. Four Star Farms supplies a variety of hops that we use in our hopped kombucha. This variety is only available on tap at select locations. Fairly-traded certified organic jasmine green tea. Certified organic whole schizandraberry puree grown at Chang Farm in Whatley, MA.